Nothing has been spared in making Nelson's "Signature Series Bibles" into examples of the finest Bible craftmanship. 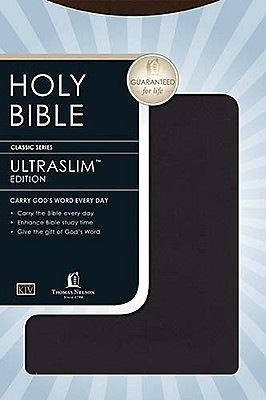 Nelson's UltraSlimTM Bible is perfectly suited to the active lifestyle of people on the go. Less than three-fourths of an inch deep, it demands little space in a suitcase or briefcase. Yet this UltraSlimTM Bible contains a concordance and full-color study maps - more than you'd expect in a Bible this compact.